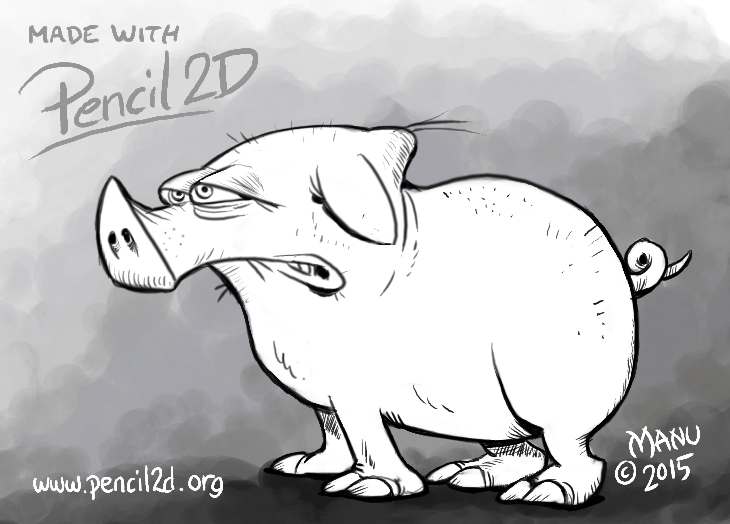 I haven’t tried Pencil2D for some months so just now I had some extra time to kill but my inspiration wasn’t exactly what I wanted so I ended up with this angry pig. I can’t blame Pencil2D in any way. I still think it’s a great tool to draw with and to animate with the traditional way. I don’t know why but with Pencil2D it’s like my Wacom tablet works even better than with other paint programs. Maybe it’s my imagination? No, really you should try it yourself, it’s just so fluent to paint with. I also noticed there is a new version in the works, that sounds good since the most current working version is amost a year old now. Let’s hope development speeds up because this progam has so much to give. This entry was posted in Digital Art, News and tagged Pencil2D. Bookmark the permalink.